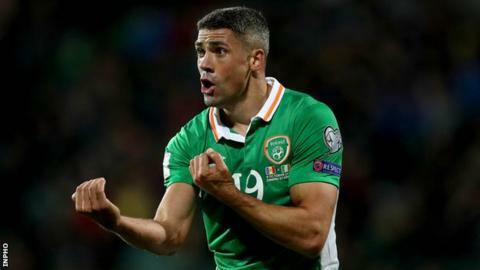 Injury doubt Jonathan Walters handed the Republic of Ireland a boost when he took part in training on Wednesday for the World Cup qualifier with Georgia. Walters has not trained fully since joining up with the squad after missing Burnley's 1-1 draw with Tottenham Hotspur because of an ankle injury. The 33-year-old striker took part in the open part of the session, but his fitness will be carefully monitored. Sunderland defender John O'Shea sat out the session with a tight calf muscle. O'Shea's team-mate, winger Aiden McGeady, trained after being given permission to arrive late following the birth of his son. After Saturday's game in Tbilisi, the Republic will host Serbia in Dublin on Tuesday in the second fixture of a crucial double-header. Burnley's Jeff Hendrick will miss the match against Georgia with a thigh strain, but has not yet been ruled out of the encounter with Serbia. Everton midfielder James McCarthy will sit out both games because of a hamstring problem, while Eunan O'Kane of Leeds is absent with a thigh strain. Walters' double in the play-off second leg against Bosnia-Herzegovina secured Ireland's place at Euro 2016 and his equaliser against Austria at the Aviva Stadium in June ensured the Republic remain in the hunt for World Cup qualification from Group D.
O'Neill reduced his provisional 39-man squad to 25 on Monday, with uncapped Preston forward Sean Maguire, Colorado Rapids striker Kevin Doyle and Reading trio Paul McShane, Stephen Quinn and Liam Kelly among the players trimmed from the original extended squad. Bradford City goalkeeper Colin Doyle also dropped out along with Derby defender Alex Pearce, Brentford centre-back John Egan, Wolves' Matt Doherty, plus Preston duo Greg Cunningham and Alan Browne. O'Neill's side are level on points with group leaders Serbia, who they play in Dublin on 5 September - three days after Saturday's away encounter against Georgia.